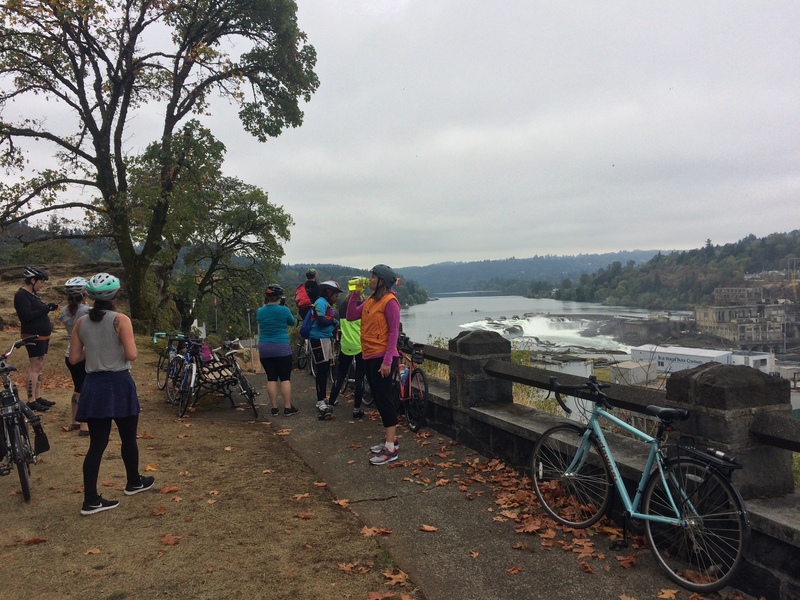 On World Car-Free Day (September 22nd) I joined eight other women to bike to Oregon City. I’d heard that it was fairly close and fairly flat so this seemed like a perfect test run to see if it would be a good trip to make with the kids. 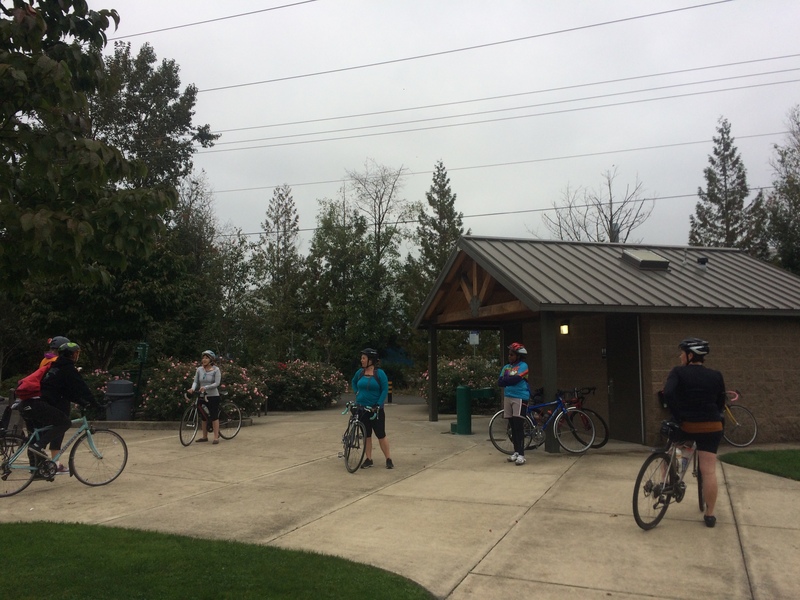 The ride was organized by Women Bike, a program of The Street Trust–an Oregon transit, walking, and bicycling non-profit based in Portland. I found it via their Facebook group. I nearly didn’t make it to the ride; as I rode to the meeting point, a squirrel darted across the street in front of me and smashed into the side of a car coming from the other direction. It lay twitching in the road as I pedaled past. I’d noticed the squirrel on the sidewalk, before it started across the street, but the woman driving the car who killed it didn’t even register the small bump. I had to staunch the urge to turn around and head back home. Obviously, the squirrel didn’t represent a squirrel, the squirrel was everyone and anyone lost to shoddy implementations of Vision Zero. Anyhow, I sucked it up and continued along to Grand Central Bakery in Sellwood where I met seven awesome women (one more joined us en route) and we soon took off for Oregon City. We sort of knew what to expect from this great Bike Portland guest post: Trolley Trail tour: You can now ride Portland to Oregon City nearly carfree…except it turned out being a lot quicker than we thought it would be, both because it was fewer miles than we had estimated and because we traveled faster than the advertised “brisk-but-still-leisurely pace of about 10mph” given the makeup of our group. The route wasn’t completely straightforward and our ride leader, Lise, stopped briefly a few times to check the map and keep us on course. I’ll turn my Strava recording into a Ride with GPS route I can easily follow before going on my own. 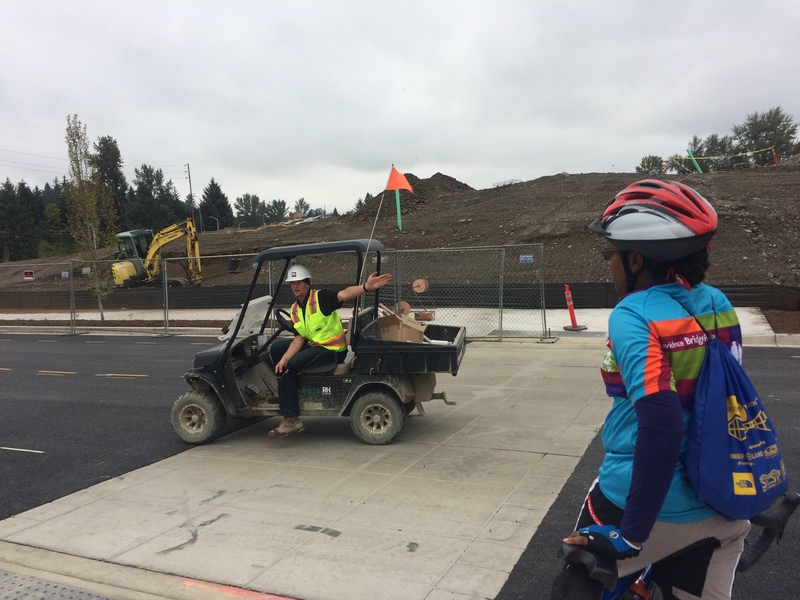 The first cool thing we saw was early in the trip, along the Sellwood/Milwaukie 17th Avenue Multi Use Path, when we came face-to-brush with a tiny street sweeper! 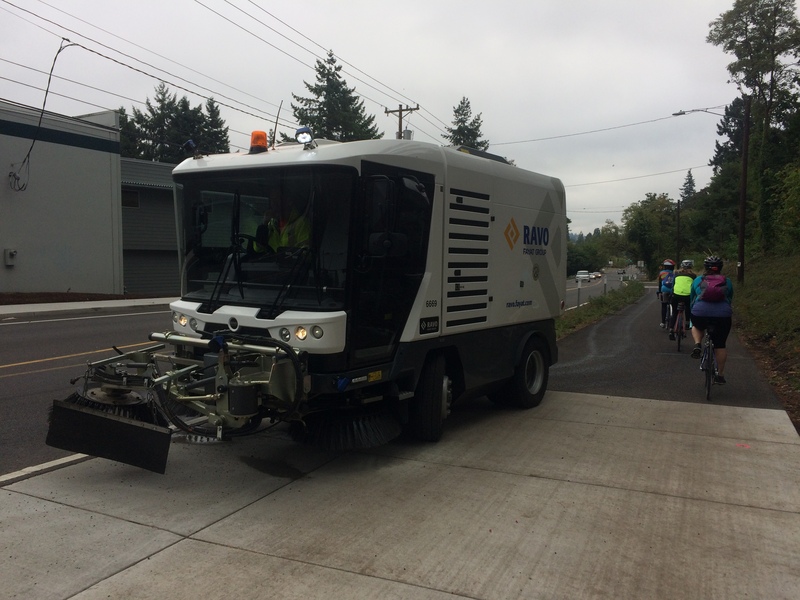 I read about this four years ago on Bike Portland: Portland buys a new, bike path-sized street sweeper (and Seattle was supposed to buy one, too, but I don’t think that ever happened: Seattle Bike Blog: Seattle will purchase skinny bike lane sweeper machine). 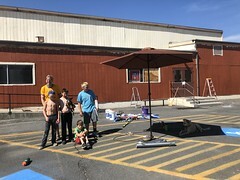 It turns out this one we saw belongs to the City of Milwaukie, and the kids and I got to see it up close two days later at Sellwood-Milwaukie Sunday Parkways where it was parked next to a full-sized street sweeper for a dual naming contest. 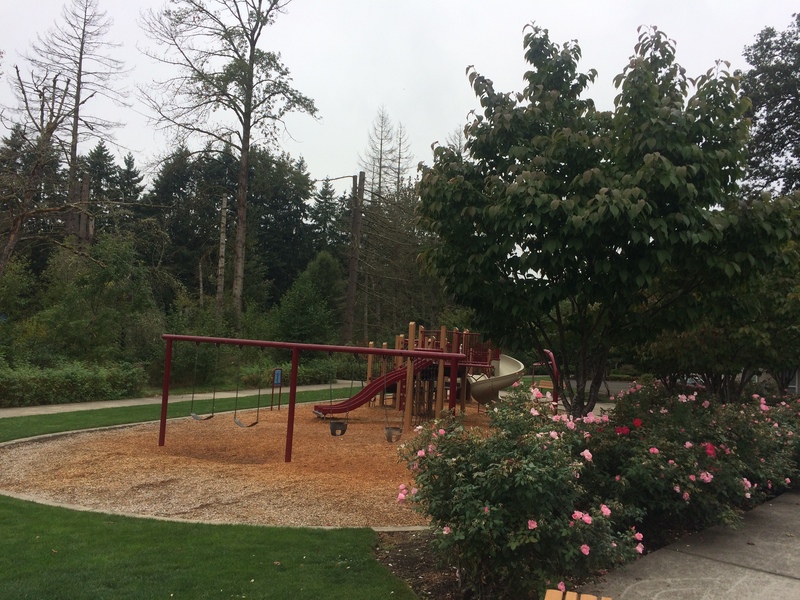 Next up, halfway to Oregon City we discovered the perfect restroom/drinking fountain/playground stop: Stringfield Family Park. As we approached Oregon City I saw a billboard for the End of the Oregon Trail Interpretive & Visitor Information Center which I can’t wait to check out with the kids. We didn’t ride by it in the group, but it looks bike accessible as I look at the map. 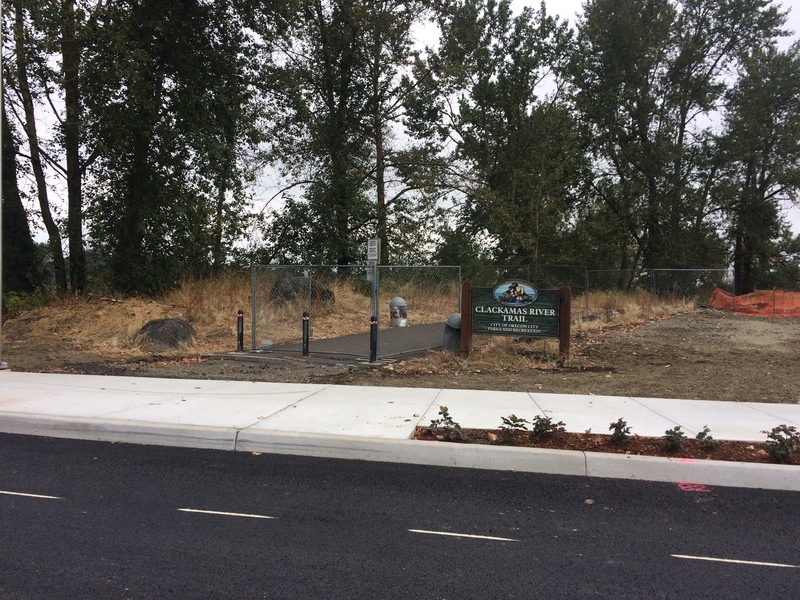 The last bit of the Trolley Trail wasn’t done, but there was an arrow spray painted on the road directing us towards Oregon City. A guy working on the site also gave us directions. Our plan was to hang out in Oregon City for an hour, exploring the area and finding a spot for lunch. 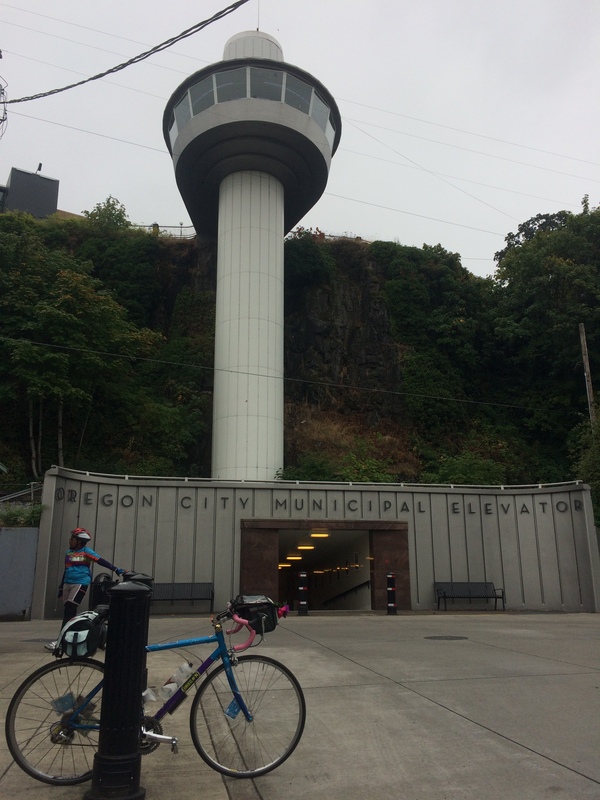 One of the women on the ride had been to Oregon City recently for an Oregon Trail themed 5K run and told us about the elevator and trail up on the second terrace so we headed for the Oregon City Municipal Elevator. I love the elevator! It’s older than Seattle’s Space Needle and is the only outdoor municipal elevator in the US (and one of only four in the world). Bicycles are allowed in the elevator so four of us squeezed in with the operator for the first run. The remaining five opted to carry their bikes up the stairs. They were very quick to arrive and meet us, but I’ll use the elevator for future visits, even if I have to wait because it’s quite the walk. The observation deck is full of lenticular images (two-in-one holograms) and educational signage. 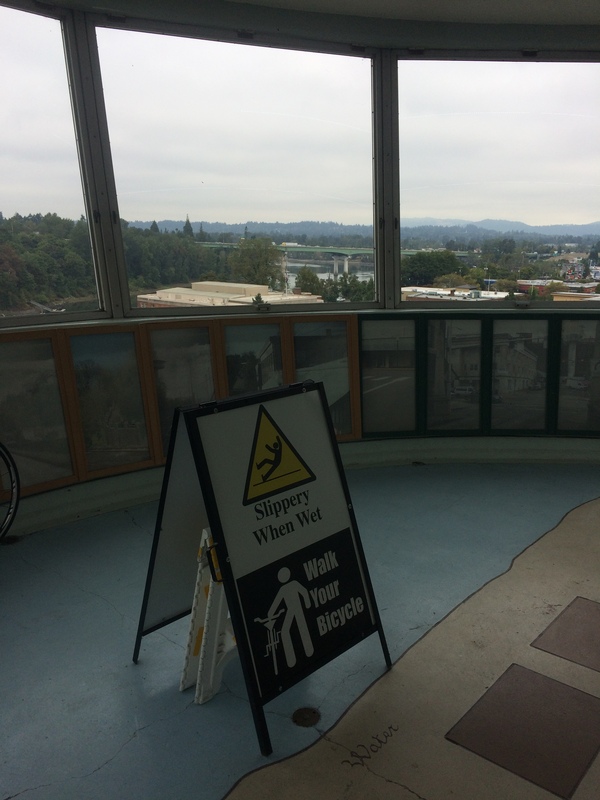 We walked and biked along the McLoughlin Promenade a ways for a lovely view of the Willamette Falls. One of our group was an architect who recently had a project in Oregon City and told us about the three terraces. We split up for lunch, half of us at Oregon City Brewing Company (which is large indoors and out and looks good to visit with kids and dogs!) and half somewhere with vegetarian choices. I’m thankful to have found this great resource. Two women knew each other from before, but the rest of us were all new to one another. Also in our group was a woman from the Portland chapter of Black Girls Do Bike. 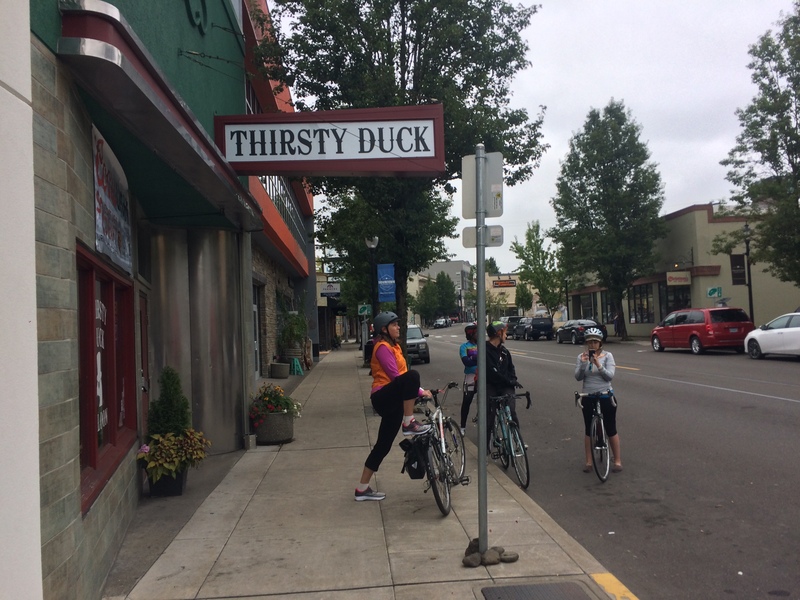 Portland has a lot of great resources for women, see Bike Portland: Portland’s network of bike clubs for women is thriving. I look forward to exploring more of the area with more of these groups!